Not long ago, I was on an afternoon flight from Dallas to Santa Fe’s small municipal airport. It was one of those magical flights: the evening sun glowing through the fuselage, bathing everything in radiance, the desert below us hazy and soft looking, the air smooth as a mill pond, and the mountains on the skyline as jagged as those in some fairy-tale land. The atmosphere in the little plane was thick with peaceful anticipation. Some passengers were no doubt looking forward to an exotic visit to the desert city. Others, many perhaps, were going home, returning to their remarkable hometown, a place not just unlike any other, but one that ranks among the continent’s treasures, with its incomparable blend of natural beauty—at the meeting of mountains and plains, desert and hills—and of deeply mature cultures. As it happened, when I glanced around the cabin I realized that I knew at least half a dozen people on the flight. One was an artist with an international reputation who lives and works in Santa Fe. The others, it slowly dawned on me, were, without exception, artisans. They were all craftspeople. It got me thinking about the little capital city I call home, and why I love it more and more the longer I live here. There are the obvious things. It’s America’s answer to France’s Provence, the place with the luminous light discovered by the artists in the late 19th century; a place with ancient cultures that are not veneers laid over the landscape, not transplants, but that have grown up in symbiosis with the land, and truly belong. Santa Fe also has a history of being outside the mainstream, of thinking for itself, of being less in thrall to the dominant culture and its overbearing work ethic. It’s one of the few places in the U.S. that is sprinkled with a magical pinch of mañana dust. But none of these things, for me, is the real story of Santa Fe. Back in the 1980s, the brilliant, enigmatic travel writer Jan Morris, in an insightful essay about the city, wrote that its authentic character was not the adobe wonderland packaged for tourists, or the New Age fantasy sought out by seekers, or the lotusland of the post-hippie days. Instead, she found her way into a milieu of serious, hardworking artists. Leathery of skin and temperament, these people, in her view, were what made Santa Fe distinctive, and created its genuine and unique constituency. I began to wonder if things had shifted slightly since Morris wrote that essay. As I thought about all my friends and acquaintances here, I began to detect a pattern. Yes, there were artists of different kinds among them, but more than that, many were some sort of artisan or independent craftspeople: jeweler, blacksmith, bookmaker, watchmaker, leatherworker, woodworker, tailor, weaver, potter, ceramicist. I began to wonder if the deepest value shared by Santa Feans was not so much exceptional creativity as exceptional skill, care, devotion—true craftsmanship, in other words. As I thought about it, it occurred to me that other friends of mine here—an investment manager, a PR consultant, a writer, a handful of teachers, a theater producer, an actor, a psychologist, a yoga teacher, a magazine editor, and so on—had the same quality. It wasn’t so much about whether someone worked in an arena that would traditionally fall under the rubric of art or craft. It was about the exemplary approach to one’s work. Nearly all of these people were self-employed, as are many here. But more than that, they all shared a devotion to excellence. Whatever you do here, you do it well, with care, diligence, and excellence. Whatever it is, you make it your craft, your art. Maybe that sprinkle of mañana dust in the air makes Santa Feans a little less rushed, gives them the time to take the care to do things well. In a town of artisans, pride in one’s workmanship matters. Whether it’s the ironwork of Tom Joyce, the blacksmith who won a MacArthur Fellowship, or the pottery of Jody Naranjo, who uses traditional methods to create utterly contemporary work, quality in the air. The true craftsperson, the authentic artist-artisan, knows that there’s an alchemy that can turn any piece of work into the gold of excellence: It’s all about diligence and skill, about loving what you do and therefore doing it as well as you can, time after time. This is what Santa Fe is really about. On the plane, my artist friend was showing me pictures of her latest graphite sculptures—incredibly beautiful and finely worked geometric shapes, some of them hundreds of pounds in weight, that are sought after by museums all over Europe. She takes infinitesimal pains to get them just right, and it gets noticed. Another, an architect, sitting one row forward, turned around to show us the plans of a new office building she’d designed: once again, the pride in the work, the ingenious, careful, thoughtful touches she’d created and was now happily talking us through. You can see it around town, too. There are many sculptures and works of art out in the streets, but it’s not just that. Inventiveness and innovation are built into the fabric of Santa Fe. It’s nothing new. There are modern bus shelters adorned with imaginative iron work and ceramics, and ancient portales, each with its own decorative touches on its vigas. No two adobe gateways are the same—you can see how, for centuries, the craftsmen here have been creating their own particular look, with intriguing results. Many of the houses are traditional and idiosyncratic in equal measure. Being master of one’s medium should bestow a freedom, a capacity to respond creatively to tradition, not just ape it. Here, it does. 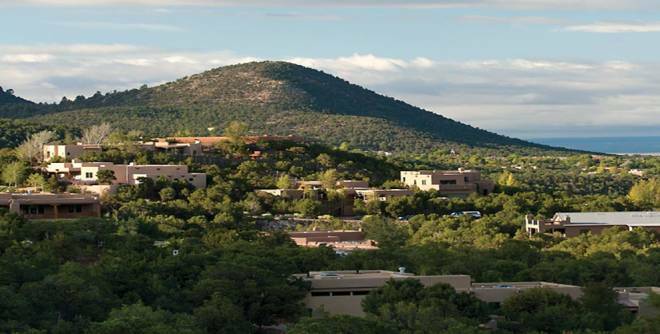 To construct, in Santa Fe, is to create. In the plane, the light was thickening as the sun lowered. A great shoulder of Sangre de Cristo mountain rose out of the suede-textured desert off our wingtip, bluish in the late light. Although it was still daylight, the lights of the little city had come on ahead of us; we could see them sparkling on the land, each light like a pearl or sequin embedded in some rich cloth. We were losing height, and the plane’s engines thrummed more deeply. We banked over the city, and the last of the sun winked through the cabin. Just for a moment, it was like a mantle of gold that fell over us as we came in to land. Doubtless many of us felt a shiver of gratitude and relief as we touched down in this haven of immemorial skill. Henry Shukman is a novelist, poet, journalist, and teacher at Mountain Cloud Zen Center, in Santa Fe.